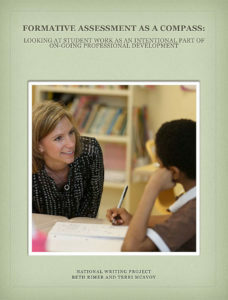 This book presents thinking from two NWP sites during the National Writing Project’s 2012-2013 SEED evaluation study, a year-long intensive professional development study in high-needs elementary schools. With a main purpose of presenting ways that intentional review of student work can be a guide in professional development, the book will also show consultants how to use formative assessment with teachers as a way of planning lessons that fit with classroom and student. The book starts with a definition of formative assessment and the connection between assessment and student work and then moves to the challenges of looking at student work in professional development. The book also offers strategies for when and how to notice what’s going on with students for the purpose of moving them forward as writers as well as examples of how those strategies worked across a year with real teachers in authentic conversations.